The purpose of the following page is to serve primarily as a research and information page on the brief but historically important occupation of Fenton Field by the 64th Squadron, 43rd Bomb Group USAAF. Although it only occupied the aerodrome for a little under two months, the 64th Bomb Squadron was the first operational group of long range heavy bombers to make use of the newly constructed field. Due to the brief amount of time it spent at the field and due to the frantic nature of operations in 1942 as the Allies began to stem the tied of Japanese advances in the Pacific, little information exists regarding this squadrons stay in the Northern Territory. It is this lack of information that fires the imagination somewhat and compels me want to know more about this period in Fenton’s historical timeline. As such it is hoped that this page will inspire others to contribute their knowledge and share in the journey to uncover this “lost” period in history. *This page in no way claims to have the full and complete story of the 64th stay at Fenton, and only displays what information has been currently uncovered. An excellent example of Australian made 64th Bombardment Squadron USAAF patch. According to USAAF combat chronology documents, the 64th Squadron came to occupy Fenton Field on the 2nd of August 1942, although the History of the 43rd Bomb Group (H) maintained by the Air Force Historical Research Center, Maxwell AFB, Alabama states that elements of ground echelon arrived at Fenton around the 14th of July 1942 to start preparing for the arrival of the unit and begin the establishment of a permanent camp (History of the 43rd Bomb Group (H), Period: 15 January 1941 to 29 February 1944). The 64th had until this time been briefly stationed at Daly Waters some 227 miles to the south. 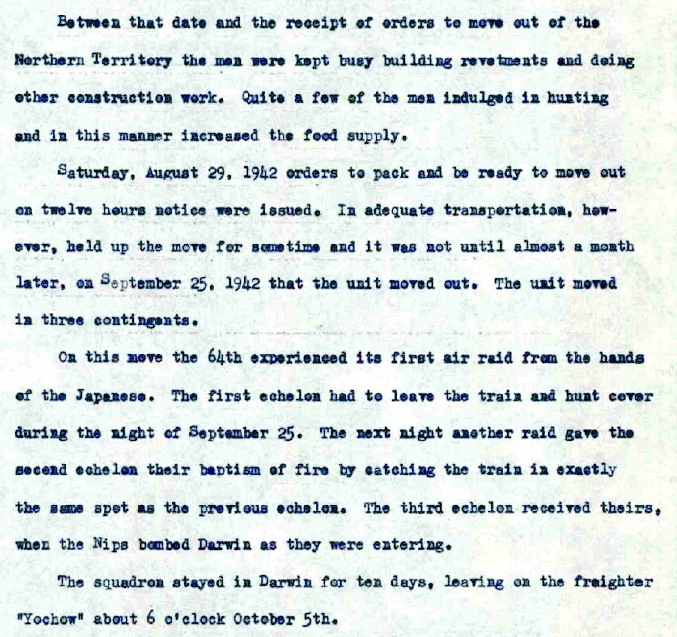 The order to move to Fenton was issued on the 30th July 1942, with ground units moving by truck to Birdum and from there by train to Brocks Creek with the final 10 miles being completed by truck (History of the 43rd Bomb Group (H), Period: 15 January 1941 to 29 February 1944). The first aircraft did not arrive at Fenton until sometime between the 30th of July and 5th of August as stated by Glen E. Spieth in his article entitled “Missing in Action”. 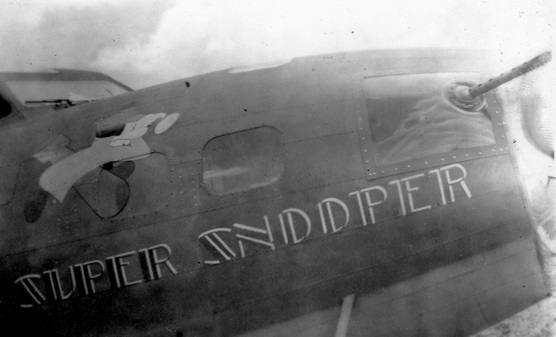 The History of the 43rd Bomb Group (H) documents state that the the first B-17 arrived at Fenton on the 30th of July. The 43rd Bomb Group historical documents continue onto state that “four airplanes of the B-17E type were assigned to it (64th Squadron) along with two complete combat crews” (History of the 43rd Bomb Group (H), Period: 15 January 1941 to 29 February 1944). This in itself conflicts with Osbourne’s fortress logs which clearly indicate that all of the fortresses to be stationed at Fenton were of the F model apart from 41-2467 “Chief Seattle” which was an E model. 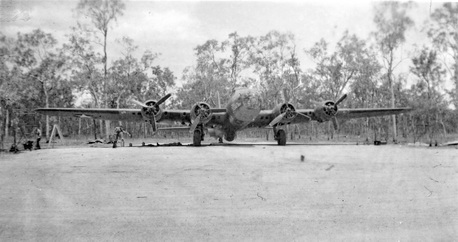 Spieth states that the first aircraft to arrive on the 5th was that of B-17E 41-2467 “Chief Seattle” from Charleville via Daly Waters (Missing in Action G.E. Spieth, accessed 7/12/14). Other B-17’s arrived after the 5th, with the B-17F 41-24424 “Hell from Heaven Men” arriving the day after on the 6th. According to USAAF chronology documents, the 64th flew their first mission on the 13th of August 1942, while the History of the 43rd Bomb Group (H) documents state in contrast that only “a small amount of flying time was built up during the time the aircraft remained in the squadron”. 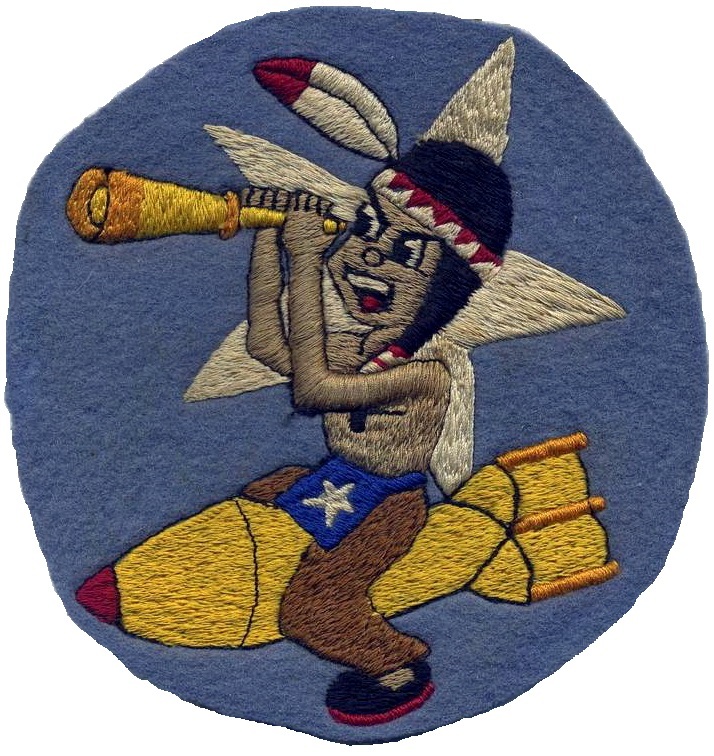 (History of the 43rd Bomb Group (H), Period: 15 January 1941 to 29 February 1944). 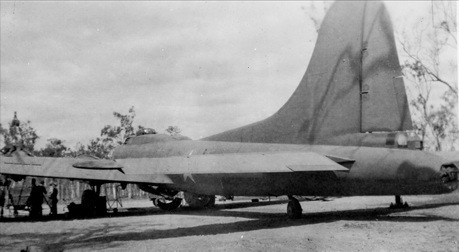 The 43rd BG documents state that no combat missions themselves were actually flown from Fenton as all the aircraft (four) of the Squadron departed for service with the 19th Bomb Group in the Solomon Islands battle on the 12th of August 1942, with the ground echelon units not departing Fenton until the 25th of September 1942. (History of the 43rd Bomb Group (H), Period: 15 January 1941 to 29 February 1944). Despite the lack of evidence regarding operational matters coming to light, the 43rd Bomb Group (H) documents do provide good information on the daily life of the 64th ground units at Fenton between the period of the 12th of August when they lost their operational aircraft and their own departure on the 25th of September. See extract below. History of the 43rd Bomb Group (H), Period: 15 January 1941 to 29 February 1944, pages 13 and 262, maintained at Air Force Historical Research Center, Maxwell AFB, Alabama. Can anyone provide information regarding missions and activities of the 64th Squadron during this time? The 64th Squdron at this point in its history appears to have operated a mixed bag of Boeing B-17E and B-17F Fortresses with many B-17’s being constantly reassigned to different squadrons of the 43rd Bomb Group as the strategic situation warranted. 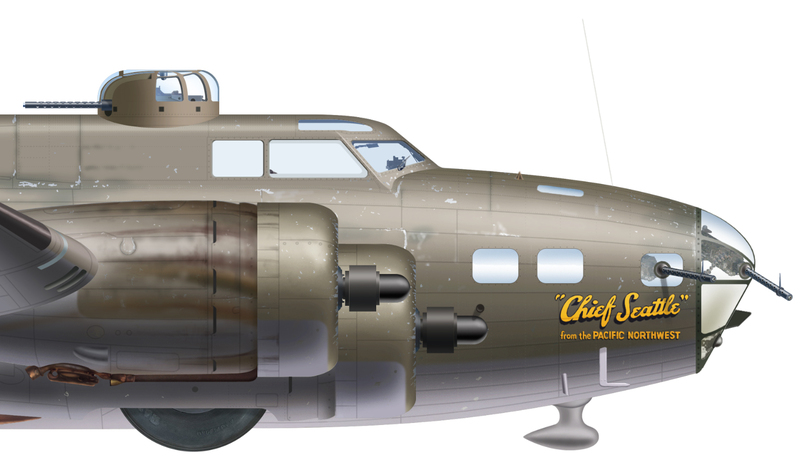 Indeed the B-17E 41-2467 “Chief Seattle” appears to have only spent a grand total of one day at Fenton, according to Spieth, before being reassigned to 435th Squadron of the 19th Bomb Group based at Townsville (Missing in Action G.E. Spieth, accessed 7/12/14). According to the B-17 FORTRESS MASTER LOG compiled by Dave Osborne, the following B-17’s were known to have operated from Fenton Field, apart from B-17E 41-2467 mentioned previously. The nose art of “Chief Seattle” 41-2656 as she appeared in August 1942. As mentioned above, Chief Seattle was the first aircraft of the 64th Squadron to arrive at Fenton on the 5th of August 1942 and departed on the 6th or the 7th of August 1942. According to B-17 master log (B-17 Fortress Master Log D. Osbourne, accessed 7/12/14) the aircraft was confirmed as MIA on a mission over Rabaul on the 14th of August 1942 only some 9 days after first arriving at Fenton Field in the Northern Territory. A profile of “Chief Seattle” 41-2656 illustrating how she would have appeared at Fenton Field NT in August 1942. 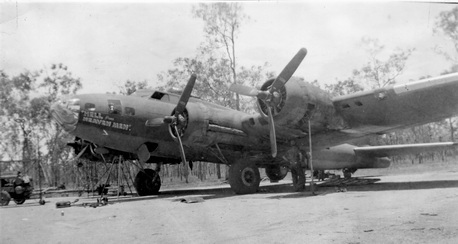 According to the Master Logs (B-17 Fortress Master Log D. Osbourne, accessed 7/12/14) this B-17F was first assigned to the 28th Squadron 19th Bomb Group at Mareeba before being reassigned to the 64th Squadron on the 6th of August 1942 for operations out of Fenton Field. 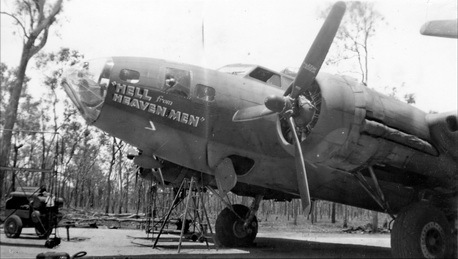 Believed to have been taken in November 1942 after her deployment to Fenton, these following series of photos shows “Hell from Heaven Men” (41-24424) being serviced on a hardstand at Mareeba, Queensland. Another view of 41-24424 at Mareeba. Interestingly the serial number on the tail appears to have been painted over. According to the Master Logs (B-17 Fortress Master Log D. Osbourne, accessed 7/12/14) this B-17F was assigned directly to the 64th Squadron when it arrived in theater and arrived on station at Fenton on the first of September 1942. 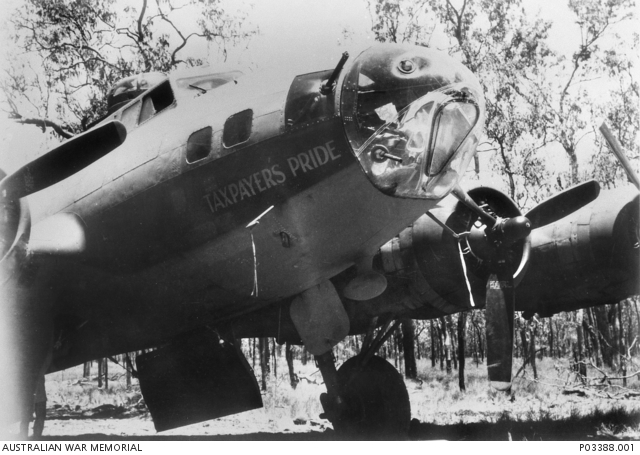 A photo of Taxpayer’s Pride at Mareeba, Queensland in late 1942. A Wright Cyclone R-1820-65 being changed off a B-17E of the 64th Squadron at a remote airstrip in North Australia. 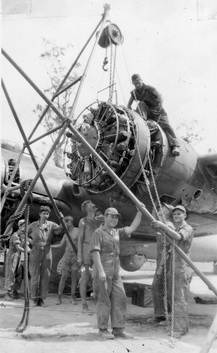 Working conditions were primitive at remote bases like Fenton and sweat, muscle and innovation was key to keeping these aircraft serviceable. A big thank you to Mrs. Louise Terrell who provided me with invaluable assistance and documents for this page.